Malta has been an EU Member State since 1 May 2004 and the adoption of EU Directives coupled with a unique full imputation system of taxation as well as tax refunds has developed the country into an international financial centre. Malta is the country of choice for foreign investments into the EU. However, several companies in a multitude of sectors have set up in Malta for several reasons. Although the country and the local market are small, companies have no restrictions in accessing the EU market and beyond. Malta has developed an advanced IT infrastructure, very good telecommunications and connections, an extensive treaty network, a professional and business friendly atmosphere amongst professionals and regulators, and a can-do attitude all of which have contributed to Malta’s success beyond its relative size. Maltese registered companies are subject to income tax on chargeable income at a standard rate of 35%. Companies incorporated in Malta are subject to tax on their worldwide income but companies incorporated outside Malta but are tax resident in Malta by virtue of their effective management and control are subject to tax on income arising in Malta and income remitted to Malta. One may also claim that companies are not effectively subject to tax because of the full imputation system of taxation whereby the tax paid by the company is credited in full to the shareholder/s following a distribution of profits. This ensures that there is no double taxation as often happens under the classical system. Moreover, a system of tax refunds which shareholders may claim depending on the source of income leads to an effective tax rate which may be well below the 35% tax rate applicable to companies. 1 Foreign Income Account (FIA) Foreign source passive income such as dividends, interest, royalties, rent etc. and all capital gains from foreign sources (unless exempt). 5/7ths in the case of passive interest and royalties. 2/3rds where company claims double taxation relief including FRFTC. 100% in the case of income from a Participating Holding. 2 Maltese Taxed Account (MTA) Profits from trading activities and profits which are not allocated to the FIA, IPA or FTA. 6/7ths in the case of trading income. 5/7ths in the case of passive interest and royalties. 4 Final Tax Account (FTA) Profits subject to a final withholding tax and income exempt from tax (e.g. participation exemption). None. No tax refunds. 5 Untaxed Account (UA) The difference between the company’s accounting profits or losses and the total of the amounts allocated to the other four tax accounts. None or a FWT. A comparative study shows that Malta has one of the best participation exemption regimes. A Maltese company in receipt of dividend income or capital gains from a participating holding may claim the participation exemption. Alternatively, the company may elect to be subject and pay tax and this would enable the shareholder to claim a full refund. A right to assets available for distribution on a winding up of that company. A company is an equity shareholder in a company and where the holding of such shares is for the furtherance of its own business and the holding is not held as trading stock for the purpose of trade. it does not have more than 50% of its income derived from passive interest or royalties. the non-resident company or its passive interest or royalties are subject to tax of not less than 5%. A portfolio investment is an investment in securities such as shares, bonds and such like instruments, held as part of a portfolio of similar investments for the purpose of risk spreading and where such an investment is not a strategic investment and is done with no intention of influencing the management of the underlying company. Also, the holding of shares by a Maltese company in a foreign body of persons which derives more than 50% of its income from portfolio investments is deemed a portfolio investment. The participation exemption may also apply to a participating holding in certain partnerships, collective investment vehicles and European Economic Interest Groupings. TAS: Tax at Source. The credit of the tax paid by the company given to the shareholder is the effect of the full imputation system. COMET: Combined Overall Malta Effective Tax. This is the net effect of the tax paid by the company and the tax refund received by the shareholder in Malta. It is pertinent to point out that a tax refund becomes due to the shareholder by the Inland Revenue Department within 14 days from when the company’s audited financial statements (accounting for the dividend distribution) and a complete and correct income tax return are submitted to the tax authorities, the tax liability is paid in full and an application for refund on the prescribed form, together with the dividend certificate and other documents as requested by the International Tax Unit are submitted by the shareholder or his tax representative. Income tax is paid in the same currency as the company’s share capital, which is also the currency in which the company prepares and submits its audited financial statements. The tax refund is also paid in the same currency, thus eliminating any forex risks. A branch or a permanent establishment (PE) of a foreign company is subject to tax at the standard rate of 35% on the profits attributable thereto. It is interesting to note that the shareholders of the foreign company may still claim tax refunds provided the foreign company distributes profits which have been subject to tax in Malta (at the level of the branch or PE). This may also apply to a foreign company which is tax resident in Malta by virtue of its effective management and control. Such foreign companies registered in Malta are referred to as an ‘oversea company’ because of the same terminology used in The Companies Act. Maltese legislation provides for Advance Revenue Rulings (ARR) which may be obtained by application from the International Tax Unit of the Inland Revenue Department. ARRs are valid for a period of five years and are renewable. The ARR is still valid even if there is a change in legislation although in this case the ARR expires once two years are over from the legislative change. The attractiveness of ARRs has somewhat decreased following the EU Directive whereby the Maltese tax authorities provide information related to ARRs to the EU Commission and other EU Member States. Malta has recently introduced the concept of a notional interest deduction (NID) aimed at mitigating the differences in the tax treatment between equity and debt financing. Before the introduction of these rules, debt financed entities could claim a tax deduction equivalent to the interest however no similar deduction was available for equity financed companies. NID entitles companies to claim a tax deduction equivalent to the notional interest calculated on its equity thus making equity financing on the same level playing field as debt financing for taxation purposes. NID is optional and may be claimed if all shareholders approve the claim for such a deduction. These rules are applicable to Malta registered companies, permanent establishments situated in Malta as well as partnerships. NID is determined by multiplying the reference rate to the invested risk capital. The reference rate is the risk-free rate set by reference to the current yield to maturity on the Malta Government Stocks with a term of approximately 20 years plus a premium of 5%, and the invested risk capital of the undertaking is the share capital, share premium, retained earnings, and non-interest-bearing loans an any contributions made by the shareholder/s. Any capital directly employed in the production of income which is exempt from tax does not fall part of the invested risk capital. NID is limited to 90% of chargeable income. Any excess above the capped amount may be carried forward for deduction in future years. When an undertaking claims NID, the shareholder / partner is deemed to have received income equal to the NID and the provisions relating to the taxation of interest income shall apply with the option to apply NID against the deemed interest brought to charge. An amount equal to 110% of the profits relieved from tax through the NID shall be allocated to the undertaking’s final tax account. The amount allocated to the final tax account is limited to the total profits of the undertaking and any such excess shall be ignored for allocation of tax profits. One of the main advantages of NID is that the COMET may be reduced and eliminates the need for the shareholder to claim tax refunds. Step-up upon an inward redomiciliation. Avanzia Taxand is a corporate service provider licensed by the Malta Financial Services Authority and may also act as tax representative with the Inland Revenue Department. Tax advice and tax compliance remain our core focus and we ensure that clients are always in compliance with the myriad filing obligations and notifications. Malta does not impose any withholding tax on outgoing dividends, interest and royalties irrespective of the recipient’s tax residence and status. However, income received from foreign sources may be subject to a withholding tax and suffer other foreign taxes and therefore Malta offers three main types of double taxation relief to ensure that any double taxation is mitigated as much as possible. Apart from the relief under Malta’s treaty network, Malta also gives relief for any double taxation on unilateral basis and allows a flat rate foreign tax credit on foreign source income and capital gains. Any overseas tax suffered may be allowed as a credit against the tax chargeable in Malta which is levied on the gross amount. The credit shall not exceed the total tax liability in Malta on the receipt. Unilateral relief for underlying tax is also available where the taxpayer is a person that holds more than 10% of the voting power of the overseas company paying the dividend. the amount of that tax. A Flat Rate Foreign Tax Credit (FRFTC) may be claimed by a Maltese company which receives income from overseas. A certificate from the auditor stating that the income arose overseas will be sufficient for this purpose. Even if the company has no deductible expenses, the rate of tax is reduced from 35% to an effective rate of 18.75%. Upon a distribution of taxed profits, refunds will apply and so the net effective tax is reduced to 6.25% or lower. Malta has an extensive double taxation treaty network with over 70 double taxation agreements most of which are based on the OECD model convention. The maximum reduced withholding tax rates on dividends, interest and royalties paid to residents of Malta are as indicated hereunder. Since Malta is an EU Member State, the Parent Subsidiary Directive and the Interest and Royalties Directive may also apply and the withholding tax rate could be reduced even further. Redomiciliation is the process whereby a company registered in a particular jurisdiction migrates or is continued in another jurisdiction without the need to be wound up or liquidated. As a result, the main advantage of a redomiciliation is that there is continuity of the entity and there is no need to renegotiate agreements, transfer assets etc. Malta allows both inward and outward redomiciliations and no exit taxes apply. On the other hand, a company migrating from a foreign jurisdiction to Malta may ‘step-up’ the value of the assets without any Maltese tax implications. A foreign body corporate wishing to migrate to Malta must be similar to a Maltese company. that no proceedings for breach of the laws of the jurisdiction in which it was registered have been commenced. Any other information which the Registry of Companies may require. A registration fee must be paid and this varies between €245 for companies with authorised share capital not exceeding €1,500 and €2,250 for companies with authorised share capital of over €2.5 million. Should the foreign company be a public company or carry out activities which if conducted in or from Malta require licensing or authorisation such as companies providing investment advice, insurance companies, banks and financial institutions, trustees, etc., additional documentation will apply. The Registrar of Companies shall issue a Provisional Certificate of Continuation upon being satisfied that the documents supporting the request for registration are satisfactory. Its statute (as revised for the purpose of the redomiciliation) shall be considered as the company’s Memorandum and Articles of Association. Within a period of six months from the date of the issue of the Provisional Certificate of Continuation, the company must submit documentary evidence to the Registrar that it has ceased to be a company registered in the foreign jurisdiction where it was originally incorporated. Upon presentation of such evidence and the surrender of the Provisional Certificate of Registration, the Registrar will issue a Certificate of Continuation confirming that the company has been registered as continuing in Malta. Avanzia Taxand is a corporate service provider licensed by the Malta Financial Services Authority. We may assist in drafting all the necessary documentation necessary for an inward and an outward redomiciliation and liaise with the relevant authorities in order to complete all the necessary formalities. The Income Tax Act brings to charge “gains or profits from any employment or office, including the value of any benefit provided by reason of any employment or office”. The legislation does not define ‘employment’ or ‘office’ but with the introduction of the Fringe Benefits Rules in 2001 we now have a definition of ‘officer’ which means the holder of an office and includes an individual who is a director of a company, or holds directly or indirectly more than 5% of the ordinary share capital or of the voting rights in a company or is a partner in a partnership. The said rules also define ‘employee’ and ‘employer’ and therefore one can easily deduce what constitutes employment – the provision of any service under a contract, whether written or not. The Income Tax Act defines a ‘resident in Malta’ as being any individual who resides in Malta. Although not clearly defined, the Income Tax Act makes distinctions between ordinarily residence, residence and temporary residence. The distinction is primarily based on the intention to stay in Malta as well as the duration of such stay.Chargeability to tax depends on the residence and domicile of the taxpayer. Domicile is not defined in Maltese legislation. The concept of domicile is a legal concept and generally refers to the place where a person was born, lives and establishes his home and intends to live indefinitely. Maltese law adopts the UK approach to domicile whereby a person previously not connected to Malta who establishes residence here will not be easily deemed to have attained a Maltese domicile. Such a Maltese domicile will only be attained if such an expatriate has, and circumstances show, that he has lost his foreign domicile and intends to indefinitely and permanently establish Malta as his home.Married persons may opt for a joint tax computation or a separate tax computation using either parent rates or single tax rates. No deductions are given against the gross employment income which is brought to charge to tax except for a deduction in respect of private school fees, alimony payments, childcare fees, homes for elderly fees and sports fees. A report published in 2017 by the National Statistics Office shows that foreigners forming part of the population in Malta more than doubled over the last decade. Whereas in 2006 foreigners accounted for around 3% of the total population, ten years later foreigners account for more than 7% of the total population and the trend is increasing. There are several factors contributing to this increase one of which is the programmes under the remit of the International Tax Unit of the Inland Revenue Department. The current programmes are ‘The Residence Programme’ (TRP), the ‘Global Residence Programme’ (GRP) and the ‘Malta Retirement Programme’ (MRP). The TRP is designed to attract individuals who are nationals of the EU, EEA or Switzerland and who are not permanent residents of Malta. Beneficiaries may also have household staff providing a service in their qualifying property, as long as all the requisite procedures are satisfied. The GRP is designed to attract individuals who are not EU, EEA or Swiss national and who are not long-term residents. Individuals benefitting from this Programme are not precluded from working in Malta, provided they satisfy the requisite conditions for obtaining a work permit. Beneficiaries may also have household staff providing a service in their qualifying property, as long as all the requisite procedures are satisfied. The MRP is designed to attract nationals of the EU, EEA and Switzerland who are not in an employment relationship and are in receipt of a pension as their regular and main source of income. Individuals benefitting from this Programme may hold a non-executive post on the board of a company resident in Malta. This implies that the beneficiary would be prohibited from being employed by the company in any capacity. Such individuals may also partake in activities related to any institution, trust or foundation of a public character and any other similar organisation or body of persons, which are also of a public character, that is engaged in philanthropic, educational or research and development work in Malta. No customs duties or VAT on household effects. Non-EU residents may be required to put a deposit or a bank guarantee for the VAT or duty in question. Upon the expiry of one year stay in Malta, such deposit or bank guarantee is either refunded or cancelled provided the duration of stay can be proved. Any income arising in Malta is subject to tax at 35% and any household staff are precluded from benefitting from the 15% tax rate. The individual is a fit and proper person. An immovable property whose rental value is €9,600 per annum or €8,750 per annum depending on whether the property is in the north or else in Gozo or the south. The property must be used solely by the beneficiary and his / her dependents and may not be let or sub-let. Any other document requested as deemed fit by the Inland Revenue Department to assess declarations made by the applicant. The administrative fee payable to the authorities is paid with the application form. The fee for TRP and GRP amounts to €6,000 with the fee reduced to €5,500 if the qualifying property is situated in the south. The fee for the MRP is of €2,500. Any document executed outside Malta that will be filed with the application must be accompanied by an Apostille Certificate. If the documents are not in English, a certified English translation of the documents is to be produced. The ARM will also have to make certain declarations to the authorities on the prescribed form. An individual may also take up residence in Malta without the need to go through the formalities of the programmes provided he obtains a residence permit and registers with the Inland Revenue Department. This may be particularly appealing to citizens who enjoy free movement within the EU. For income tax purposes an individual is considered to be resident in Malta if his / her stay in Malta exceeds six months in a calendar year. Foreigners residing in Malta are taxed on income and capital gains arising in Malta (unless exempt) and on income remitted to Malta. Foreign source income which is not remitted to Malta is subject to Malta tax and capital gains are not taxable even if they are remitted to Malta. Avanzia Taxand is an Authorised Registered Mandatory (ARM) authorised as such by the Inland Revenue Department. We may therefore handle the application and liaise with the tax authorities. Avanzia Taxand may also act as a tax representative enabling us to deal with all compliance requirements and filing obligations with the tax authorities. A Professional Investor Fund (PIF) is a special class of a collective investment scheme (CIS) which is subject to a much lighter and more flexible regime than UCITS, AIFs and other retail funds. Following amendments introduced during 2016, PIFS may be promoted to a qualifying investor who is defined as an investor that invests a minimum of €100,000 in the PIF and which may not, at any time, be reduced below this minimum amount by way of a partial redemption. is a senior employee or director of a service provider to the PIF. The fund is required to obtain a Declaration Form in which the qualifying investor confirms that he/she/it has read and understood the mandatory risk warnings and describes why he/she/it has satisfied the applicable requirements to be considered a qualifying investor. It should be noted that the total amount invested may not fall below the established threshold of €100,000 unless this is the result of a fall in the NAV. Furthermore, provided that the minimum threshold is satisfied, additional investments of any size may be made. The minimum investment applies to each investor. However, in the case of an umbrella fund comprising several sub-funds, the respective thresholds are applicable on a per scheme basis rather than on a per sub-fund basis, thereby enabling the investor to spread the investment requirement across the various sub-funds. A PIF is exempt from risk spreading and/or diversification requirements and is not subject to borrowing or leverage restrictions other than those which may be specified in the offering document. A PIF is required to issue an offering document setting out the nature, structure, objectives, risks and functionaries of the fund. The offering document must be submitted to the MFSA before being circulated to the investors. Whilst the structuring of any fund will depend upon the promoters’ specific objectives and preferences, typical set-ups would involve the creation of voting shares issued to the fund’s promoters, providing them with the effective control over the structuring and general operation of the fund, whilst non-voting shares are issued to investors in the fund. Any changes to the rights attaching to the voting shares, redemption of such shares, and/or issue of additional voting shares will always require the prior approval of the MFSA. A PIF may be set up as an investment company with variable share capital (“SICAV”), an investment company with fixed share capital (“INVCO”), a limited partnership, a unit trust or a common contractual fund. Usually, clients opt for the corporate form (SICAV) for various reasons, including operational flexibility. A CIS may be structured as a multi-fund (umbrella) scheme, with a number of sub-funds thereunder, constituted by one or more different classes of shares (which may be denominated in different currencies). The assets and liabilities of each sub-fund are considered to constitute a separate patrimony distinct from the assets and liabilities of (and ring-fenced from the creditors of) the other sub-funds. Furthermore, it is possible for a CIS in the form of a SICAV to be constituted as an incorporated cell company (“ICC”). The ICC may establish one or more funds as incorporated cells, each cell being a limited liability company (SICAV or INVCO) with separate legal personality (unlike the sub-funds of a multi-fund SICAV, which may have their assets and liabilities treated as a separate patrimony but do not have legal personality separate from that of the SICAV) and requiring a CIS licence independently from the ICC. It is also possible to set up a Recognised Incorporated Cell Company (“RICC”). The RICC is constituted as a limited liability company, which may establish incorporated cells in the form of SICAVs or INVCOs, and which purports to provide such incorporated cells with administrative services. The RICC is required to obtain recognition from the MFSA for the provision of administrative services, while each incorporated cell must obtain a CIS licence. The rules on ICCs and RICCs are designed particularly to accommodate fund platforms. The Board of Directors of a PIF must be composed of one or more directors independent from the Manager and the Custodian. In practice, however, it is typical for two or more directors having experience in the financial services industry to be appointed, in order to ensure dual control of the fund’s business. In the case of a self-managed fund, this issue of independence between the fund manager and the fund does not exist since the fund will be managed by its own directors and investment committee, if appointed. knowledge on matters relating to principles of good corporate governance and regulatory issues. Where an external manager is appointed, such manager may be established in Malta or outside Malta. If established in Malta, the proposed manager should be in possession of a Category 2 Investment Services Licence and be duly licensed and authorised by the MFSA to provide investment management services to collective investment schemes. On the other hand, if the manager is established outside Malta, the MFSA will conduct its “fit and proper” test in respect of the manager to ascertain whether it possesses the business organisation, systems, experience and expertise deemed necessary by the MFSA for it to act as Manager. In the event the PIF appoints an investment manager that is licensed as an Alternative Investment Fund Manager (AIFM), the PIF would be become subject to an additional layer of regulation to render it compliant with the Alternative Investment Fund Manager Directive (AIFMD). It is for this reason that the PIF regime is more suitable for managers having assets under management (AUM) of less than €100 million (leveraged) or €500 million (unleveraged). In the interests of simplifying the structure, it is also possible that the fund is established as a self-managed fund. Doing so would effectively vest responsibility for the discretionary management of the assets of the fund in the Board of Directors. In proposing this structure, the fund will need to satisfy the MFSA that the fund is capable of organising and controlling its affairs in a responsible manner and shall have adequate operational, administrative and financial procedures and controls to ensure compliance with all regulatory requirements and shall provide the MFSA with all the information it may require from time to time. Where the fund is self-managed, the Board of Directors may consider appointing an Investment Committee which must be composed of at least 3 persons (who shall be expected to satisfy a full “fit and proper” probity check and competence assessment by the MFSA) and which committee shall be collectively responsible for the day-to-day investment management of the assets of the scheme according to the Terms of Reference established by the Board of Directors and approved by the MFSA. One member of the investment committee should be a resident of Malta. If the self-managed fund route is followed, the initial, paid up share capital for the scheme should be at least €125,000, or the equivalent in any other currency and the NAV of the Scheme is expected to exceed this amount on an on-going basis. If a self-managed fund exceeds the AUM thresholds of €100 million (leveraged) or €500 million (unleveraged) it would also be required to comply with specific provisions of the AIFMD. Both the administrator and the custodian appointed to service a PIF may be based outside Malta. PIFs are not required to appoint a custodian, although in such circumstances the fund would be expected to have adequate safekeeping arrangements in place, which must be satisfactory to the MFSA. a person resident outside Malta providing administrative services. The above-mentioned exemptions are not automatically operative but their applicability is subject to a determination in writing by the MFSA. PIFs are required to appoint a Compliance Officer, a Money Laundering Reporting Officer and a local auditor approved by the MFSA. If a PIF effects its investments through one or more SPVs owned or controlled via a majority shareholding of the voting shares either directly or indirectly by the PIF, the SPV(s) must be established in Malta or in a jurisdiction which is not an FATF blacklisted country. In principle, the PIF must through its directors or general partner(s) at all times maintain the majority directorship of any SPV. PIFs are permitted to use side pockets in order deal with situations where certain assets within the fund’s portfolio become illiquid or comparatively hard to value, subject to certain conditions. The use of side letters is allowed, but these must be circulated and approved by the Board of Directors / General Partner / Manager prior to issue, and must be kept in Malta at the registered office and be made available to MFSA for inspection. Drawdown arrangements, whereby investors commit themselves to subscribe for a maximum amount of units in the fund which may be issued at a discount, are also permitted subject to certain disclosure requirements and other conditions. The application for a licence to operate a PIF must be made to the MFSA. The MFSA may only license a PIF if it is satisfied that the PIF will comply in all respects with the relevant legislation, regulations and rules and that its directors and officers, or in the case of a unit trust or limited partnership, its trustee(s) or general partner(s) respectively, are fit and proper persons to carry out the functions required of them in connection with the scheme. Upon submission of all documentation relative to the licence application in draft form (to the satisfaction of MFSA) and payment of the application fee, it is usually a matter of weeks for the MFSA to issue an in-principle approval in respect of the Fund. This is then followed by a submission of all documents duly signed in original, after which the MFSA issues a licence accordingly. The PIF may appoint any service provider (e.g. investment manager, adviser, administrator, custodian or prime broker) it deems necessary. Where all service providers are based outside Malta and the PIF has not appointed a local resident director (in the case of a scheme set up as an investment company), a local general partner (in the case of a scheme set up as a limited partnership); or a local trustee (in the case of a scheme set up as a unit trust / common contractual fund), the PIF has to appoint a Local Representative. For income tax purposes, a distinction is made between prescribed and non-prescribed funds. Essentially, a CIS that has assets situated in Malta constituting at least 85% of its total asset value is classified as a Prescribed Fund. Other licensed funds, including funds in an overseas-based scheme, are Non-Prescribed Funds. In the case of Prescribed Funds, the CIS qualifies for an exemption from tax on income “other than income from immovable property situated in Malta and investment income” earned by the Prescribed Fund. The withholding tax on local investment income is 15% for bank interest and 10% for other investment income. Income derived by the Prescribed Fund from immovable property situated in Malta is taxed at 35%. There is no withholding tax on investment income received by Non-Prescribed Funds (including overseas based CISs), which enjoy an exemption from tax on income (other than income from immovable property situated in Malta) and capital gains realised on their investments. They also enjoy an exemption from stamp duty. There is no wealth tax in Malta. Foreign investors are not subject to Maltese tax on capital gains or income when they dispose of their investment (through redemption by the Fund or disposal to a third party) or when they receive a dividend or other income from the Fund. They are also entitled to benefit from the stamp duty exemption obtained for the Fund in connection with the acquisition or disposal of their units in the Fund. Avanzia Taxand is a corporate services provider licensed by the MFSA and we may assist in the application process, the drafting of documentation in connection with the legal set-up as well as some of the ongoing compliance requirements and filing obligations. Malta is known to have a stable and successful financial system leading to more business entities being set up in Malta. Following Malta’s accession to the EU in 2004, the financial services sector has grown exponentially and is nowadays one of the main pillars behind the country’s economic growth. Indeed, despite of the European sovereign debt crisis which at that time had led to loss of confidence in financial institutions, Malta’s financial services sector including the banking sector has remained, and still is, remarkably robust and also thriving. Credit institutions whose principal business is the receipt of deposits and granting of credit facilities as well as other financial services such as retail banking, corporate banking, private banking, business banking and investment banking. Banks in Malta are regulated by the Banking Act, 1994 which is founded on EU legislation and is compliant with Basel Core Principles. The Basel Committee on Banking Supervision issued a set of reform measures in banking regulation known as Basel III which were transposed into EU law through the Capital Requirements Directive IV (CRD IV) and Capital Requirements Regulation (CRR), together known as the CRD IV package. The CRD IV package was published in the Official Journal (OJ) of the EU on 27 June 2013. Member States, including Malta, were required to adopt these new laws and regulations with an effective implementation date of January 2014. The aim of these robust regulations was to strengthen the EU banking sector in a manner that banks would be able to absorb economic shocks whilst continue facing economic growth and activity. As at February 2018, 24 entities held an active MFSA licence to operate as a credit institution in terms of the Banking Act, 1994. The core banking activities are defined as the acceptance of money deposits from the public or raising of money from the public for the purpose of lending to others or otherwise investing for the account and at the risk of the bank. the Authority is satisfied that there are no close links between that company and another person/s which through any law, regulation, administrative provision or in any manner prevent the company from exercising effective supervision of the company under the provisions of the Banking Act. identity of the individuals who will be effectively directing the business of the prospective bank. Following the set-up of the Single Supervisory Mechanism (SSM) in November 2014, the European Central Bank (ECB) has become the authority in charge of all banking authorisations in the Euro Area irrespective of the size of the bank. The rules emanating from the Single Supervisory Mechanism Framework (Regulation (EU) No 468/2014) state that when the National Competent Authority (NCA) receives an application for an authorisation to take up the business of a credit institution to be established in a participating Member State, it shall notify the ECB of the receipt of such application within 15 working days. The MFSA will assess whether the applicant complies with all the national laws and regulations. If the MFSA is satisfied with the application, it will prepare a draft decision proposing that the ECB grants the application. The latter notification must be performed by the MFSA to the ECB and the applicant within at least 20 working days before the end of the maximum assessment period provided by the Banking Act which stands to be six months. The ECB will take a decision on the draft authorisation decision it receives from the MFSA within 10 working days. If the MFSA concludes that the application does not satisfy the Banking Act and hence reject the application, it will notify the ECB with its decision. An application fee of €35,000 is also required upon submission of the aforementioned application. Credit institutions licensed under the Act must also pay an annual supervision fee of 0.02% of its deposit liabilities as reported at the end of the year immediately before the year in which the fee is payable. This must not be less than €25,000 and not more than €1,200,000. Companies which are incorporated outside of Malta, but which have representative offices in Malta, shall pay the MFSA a fee of €3,600 every year. A representative office of a Bank licensed in another jurisdiction. The activities must be restricted to purely liaison activities and may not include financial transactions or execution of any documents. In such cases, the foreign bank must submit a notification to the MFSA that they have an intention of establishing an office. Upon commencement of activities, Maltese licensed banks are required to monitor the capital adequacy of their own funds in ensuring that they hold sufficient capital against the credit risk, the market risk, the operational risk, the large exposures, and the liquidity and leverage amongst other requirements whilst ensuring that effective policies and procedures and good governance are in place. The regulations emanating from the CRD IV aim at improving the quantity and quality of capital through the introduction of additional capital buffers in addition to the minimum capital requirement of 8% of the risk weighted assets of which 4.5% of the risk weighted assets must be met with Common Equity Tier 1 Capital whilst also introducing new liquidity ratios (Liquidity Coverage Ratio and Net Stable Funding Ratio), amongst others. Following the implementation of the SSM, which comprises of the ECB and the NCAs of the EU Member States, a new supervision system has been introduced. Credit institutions are classified as significant institutions or less-significant Institutions depending on criteria such as the total value of the assets and their economic importance. The ECB directly supervises institutions classified as significant through the supervision conducted by the Joint Supervisory Teams (JSTs) comprising of staff from both the ECB and the NCA. JSTs supervise around 1,200 entities (120 groups) which are equivalent to around 85% of the total banking assets of the Euro Area. In Malta the three largest domestic banks, namely Bank of Valletta plc, HSBC Bank Malta plc and MeDirect Group Limited are subject to supervision by JSTs. The NCAs are directly responsible for the supervision of the less significant institutions which make up to around 3,500 entities. Hence, the ECB is the direct supervisor of the biggest banks and indirect supervisor of the smaller banks. In the case of Malta, the MFSA is also directly responsible for the remaining less-significant Institutions. Banks are subject to an annual supervisory fee levied by the ECB. Over the last decade, the Maltese banking sector has experienced a shift towards liberalisation and foreign ownership. Indeed, highly respected names have established operations in Malta and use Malta as a strategic base for further expansion. The implementation of the European Passport Rights for Credit Institutions Regulations makes Malta an ideal platform from where a credit institution may establish itself and provide banking services across the EU or EEA and therefore benefit from the EU’s Single Market. Conversely, a credit institution which is authorized by a regulatory authority in a Member State of the EU or the EEA may benefit from the European passport to establish a branch in Malta or provide cross-border services in Malta, without being required to obtain a separate licence from the MFSA. Banks in Malta are subject to the general rules of taxation. Shareholders may avail themselves from Malta’s full imputation tax system and therefore when in receipt of dividends they are entitled to a tax credit which is equal to the tax borne on the profits out of which the dividends are paid. Shareholders may also be entitled to tax refunds upon the distribution of taxed profits. Tax refunds may be claimed on all profits excluding interest and any other income derived from the provision of loans which finance the acquisition, development or renovation of Maltese immovable property since such profits are allocated to the Immovable Property Account and no refunds may be claimed. Malta has a wide network of tax treaties which may reduce the withholding tax rates on dividends, interest and royalties paid to Malta. On the other hand, Malta does not impose or levy any withholding taxes on outgoing dividends, interest and royalties. Heavily capitalised banks may also avail from the recently introduced Notional Interest Deduction Rules which entitle companies to claim a tax deduction equivalent to the notional interest calculated on its equity thus making equity financing on the same level playing field as debt financing for taxation purposes. Other benefits emanating from the Maltese tax system include the ‘participation exemption’ on profits derived from participating equity holdings and no capital gains on transfer of shares in a non-property company held by non-resident shareholders. For further details on the Maltese taxation system in Malta, please refer to Corporate Taxation. Avanzia Taxand is a corporate service provider registered with the MFSA and we may assist in the application process with the MFSA, the drafting of documentation in connection with the corporate structure set-up as well as some of the ongoing compliance requirements and filing obligations especially those related to secretarial and taxation. The iGaming industry as well as the e-Commerce industry have significantly increased the need of payment gateways in Malta. The Maltese authorities have proactively responded to this change and now Malta become a destination of choice for the setting up of Payment Institutions (PI). Malta has developed an advanced telecommunications infrastructure and offers a highly skilled multilingual workforce making it a supreme destination to the setting up of customer care centres. PIs are regulated by the Financial Institutions Act, 1994. In 2017, the European Union (EU) had published the Payment Services Directive 2 (PSD2) (Directive 2015/2366/EU) to be transposed by Member States, including Malta, into their laws and thereby repealing Payment Services Directive 1 (PSD 1). The transposition deadline for its implementation was set to 13 January 2018. The new directive builds on the previous directive and is designed to increase consumer protection, make payments safer and enhance innovation and competition. The regulatory and supervisory requirements for PIs are less rigid than those required for other credit or financial institutions. As at February 2018, 38 companies held an active PI licence issued by the Malta Financial Services Authority (MFSA) which is equivalent to an increase of 36% over the number of active licenses in December 2016. Additionally, there are currently over 350 EU/EEA PIs exercising the freedom to provide services in Malta which have also been increasing year on year. Unlike credit institutions, financial institutions cannot fund their activities through the taking of deposits or other repayable funds from the public. Execution of payment transactions where the consent of the payer to a payment transaction is transmitted by means of any telecommunication, digital or IT device and the payment is made to the telecommunication, IT system or network operator, acting solely as an intermediary on behalf of the payment service user and the supplier of the goods and services. Payment institutions may grant credit related to certain payment services referred to in (4), (5) or (7) above only if further requirements* are met. the own funds of the payment institution are at all times, to the satisfaction of the supervisory authority, appropriate in view of the overall amount of credit granted. The authority is satisfied that there are no close links between that company and another person/s which through any law, regulation, administrative provision or in any manner prevent the company from exercising effective supervision of the company under the provisions of the Financial Institutions Act. A description of the measures taken for safeguarding payment service users’ funds. The authority will determine an application for a licence within three months of receipt of the formal complete application and will determine whether to grant a licence without conditions, a licence subject to certain conditions, or refuse the application for a licence. Cardholder A consumer who uses a credit card to purchase goods and services. Merchant A provider of goods and services who accepts credit card payments. Payment service provider A payment gateway which is responsible to acquire data authorisation and encryption. Acquiring bank The bank which holds the merchant’s bank account. 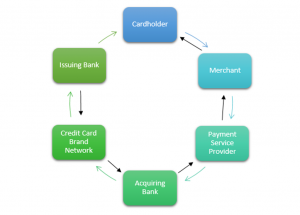 Credit card brand network This includes brands such as VISA, Mastercard and American Express, amongst others, whose networks are used to facilitate interactions between issuers and acquirers when authorising and settling transactions. Issuing bank The bank which issued a credit card to the consumer on behalf of card networks. The cardholder uses a credit card to settle a purchasing transaction. A merchant’s POS system / e-commerce website contacts the PSP who, depending on the card brand used, contacts the designated acquirer for transaction authorisation. The acquirer sends the payment details to the card association. The latter then sends the payment details to the issuing bank for authorisation. The issuing bank receives the request for payment authorisation from the credit card network and validates the data received including the credit card number and CVV number, confirms availability of funds and matches the billing address of the credit card and payment files received. The issuing bank approves or declines the payment transaction. The response is sent back to the merchant through the same channels i.e. through the credit card network, then to the acquiring bank, PSP and finally to the merchant. For successful transactions, the issuing bank blocks the purchase amount on the cardholder’s account. The authorisation and authentication process takes between two and three seconds. The merchant sends the approved authorisations on a daily basis in one batch to the PSP. The latter directs information in batches to the credit card networks for settlement who in turn sends each of the approved transactions to the relevant issuing banks. The issuing bank transfers the funds to the credit card network and the payment goes through the same channels with each party deducting a charge until the merchant’s account is credited by the acquiring bank. Eventually the cardholder settles the bill with the issuing bank. The settlement process can take anywhere from 24 hours up to 3 days. Through the implementation of the European Passport Rights for Credit Institutions Regulations, a financial institution licenced or holding equivalent authorisation in another Member State or EEA State as a payment institution, may provide the activities for which it has been authorised either through the establishment of a branch or the freedom to provide services, including by engaging an agent. The law prescribes the communication requirements for PIs that would like to passport the provision of services in Malta. An application fee of €3,500 is also required upon submission of the aforementioned application. Financial institutions licensed under the Act must also pay an annual supervision fee of 0.02% of its total assets as reported at the end of the year immediately before the year in which the fee is payable. This must not be less than €2,500. Financial Institutions are subject to the general rules of taxation in Malta. Shareholders may avail themselves from the full imputation tax system and therefore when in receipt of dividends they are entitled to a tax credit which is equal to the tax paid by the distributing company on the profits out of which the dividends are paid. Shareholders may also be entitled to tax refunds upon the distribution of taxed profits. Moreover, Malta has a wide network of double taxation agreements in place. Other benefits emanating from the Maltese tax system include the ‘participation exemption’ on profits derived from participating equity holdings and no capital gains on transfer of shares in a non-property company held by non-resident shareholders. For further details on the Maltese taxation system, please refer to Corporate Taxation. Avanzia Taxand is a corporate service provider registered with the Malta Financial Services Authority and we may assist in the application process with the MFSA, the drafting of documentation in connection with the legal set-up as well as some of the ongoing compliance requirements and filing obligations particularly those related to secretarial and taxation. Malta has a long maritime tradition and it has established itself as one of the leading maritime hubs and service centres. The Island has several yacht marinas and offers a whole range of maritime services and facilities. Malta has also developed a very strong legal and regulatory platform and Malta’s shipping register is the EU largest and one of the largest in the world. All types of vessels, both pleasure yachts and commercial ships, including vessels under construction, may be registered under the Malta flag. If the owner is not a Maltese resident person or an EU citizen, we may act as a resident agent. Vessels older than 10 years are subject to additional scrutiny by Transport Malta. Vessels older than 10 years are subject to an inspection from an authorised flag State inspector whilst vessels older than 15 years are required to undergo an authorised flag State inspection prior to provisional registration. It is customary for Transport Malta not to accept registration of trading vessels of 25 years and over although in certain circumstances this may be considered. A vessel / yacht is first registered provisionally under the Malta flag for six months during which period all documentation must be finalised. It is possible to request an extension of the provisional registration should this be required. Proof of qualification to own a Maltese vessel. If the owner is a Maltese company, we will provide all the required documentation, however, if the owner is a foreign corporate entity, we would require a declaration appointing us as resident agent, certified copies of the certificate of incorporation, statute and good standing certificate. All documents must be notarised and apostilled. We also require a signed legal opinion confirming that the records of the entity have been examined and giving details on the directors and holders of office and of the persons authorized to represent the entity and to bind it with their signature and to appoint a registered agent. Declaration of ownership made in front of the Registrar and signed by the owner or an authorised representative. A Certificate of Survey and a carving and marking note both signed by an approved surveyor. Further documents will be required for commercial or larger vessels. Once all the necessary documents are made available, a certificate confirming registration is issued by the Shipping Directorate of Transport Malta. The certificate is valid for one year and must be renewed annually together with the payment of the annual registration fees. The Shipping Directorate of Transport Malta considers a private registered yacht to be any pleasure yacht of 6 metres in length or more, which does not carry passengers for reward and is not engaged in trade but is used for the sole purpose of the owner. Yachts in commercial use which do not carry cargo and do not carry more than 12 passengers can be registered as commercial yachts under the Commercial Yacht Code. Maltese law is very advantageous for the operation of commercial yachts. Yachts in commercial use of not less than 15 metres in length and not more than 24 metres. Superyachts in commercial use of more than 24 metres in length and less than 500 gross tonnes. Superyachts in commercial use of more than 24 metres in length and 500 gross tonnes and over. A company operating a recognised commercial yacht is exempt from income tax however will be subject to tonnage tax based on the gross tonnage of the commercial yacht. A Maltese vessel owner acting as a taxable person must be registered for VAT purposes in Malta. Pleasure boat owners are required to register when the vessel is leased for a short-term period (charters not exceeding 90 days) or a long-term period (charters exceeding 90 days). The purchase of the vessel should remain VAT neutral for a VAT registered vessel owner. A vessel bought by a Maltese taxable person from another taxable person situated in another EU Member State is subject to the reverse charge mechanism and therefore no VAT is actually paid in Malta. It is also possible for a vessel acquired from outside the EU to have the vessel imported into Malta and request a VAT deferment from the Maltese VAT Department on the understanding that the vessel will be used for commercial purposes. The place of supply of a lease of a pleasure boat to a non-taxable person (whether long term or short term) or short-term charter to a taxable person is the place where the yacht is actually put at the disposal of the customer. This usually means that place of departure of the charter of the yacht. On the other hand, the place of supply of yachts for a long-term period to a taxable person is the place where the customer is established. Subject to obtaining pre-approval from the VAT Department, the yacht owner may charge VAT on a portion of the lease on the understanding that only a portion of the lease is consumed within EU territorial waters. The owner of the yacht is required to provide proof of the time the vessel would spend in the EU or, in absence of sufficient information to provide such assessment, the VAT Department may apply a predetermined percentage of the lease taking place in the EU. Such percentages are based on the length of the yacht. The effective VAT rate will be substantially reduced. We will be able to work out the VAT savings once we have the necessary details. As a VAT registered taxable person, the Maltese yacht owner may claim back any VAT incurred on business related expenses in Malta as well as apply the self imposition of VAT on invoices from EU suppliers. The yacht owner may also opt to claim back any VAT incurred in other EU Member States through the Eighth Directive subject to any conditions imposed by the Member State. The supply of sea vessels and provided to such vessels are exempted from VAT. Such exemption is only granted to sea vessels used for navigation in high seas and for the carrying of passengers for commercial, industrial or fishing activities, sea vessels used for rescue or assistance at sea or for coastal fishing as well as to sea vessels used for war. This exemption does not apply to vessels used for leisure purposes. Avanzia Taxand may act as a resident agent and we offer a one stop shop for owners wishing to register their vessel under the Malta flag. We may set up a Maltese company to act as owner of the yacht and liaise with certified surveyors as well as the Shipping Directorate of Transport Malta in order to have the provisional registration and permanent registration.